Having read several excellently written books lately, I am pleased to now add The Value of Rain to my list of must-reads. Author Brandon Shire has taken a hotly debated topic in today's society and spun a mesmerizing tale of hurt, betrayal, revenge, and ultimately peace around it. The book crackles with the tension of human emotions, injustice, and family drama. In other words, readers won't be able to stop once they begin this journey. At the book's outset, Charles is a young man of fourteen whose relationship with another boy becomes sexual, but he's caught and is committed to an institution for "treatment" to eradicate his "condition." For the next decade Charles goes through real torture, mental and physical, as he struggles to find a way out of the hell he's enduring. Once released, he is bent on revenge against those responsible for his ordeal; chiefly his mother. Almost every emotion that a person can experience is written in vivid detail here. The author has a clever and gifted approach to his writing and is fearless when it comes to crafting scenes that need to be told in a certain manner. As horrific as some of the things Charles goes through are, the reader will at last find relief from his pain as he finds peace for himself. This is a book that should be read. 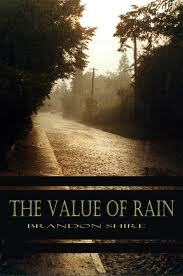 Brandon Shire gives us a story that no one will forget... and a new perspective on just what exactly rain can do. Well done indeed.